The Hayloft is a converted farm building with comfortable, 2 bed accommodation on a gated property. The heart of Castle Cary is 2 minutes walk while the garden in which the Hayloft is situated backs onto fields. The best of town and country at once! The kitchen is well-equipped and you can get everything you need to self-cater from the shops within easy walking distance. There is TV, wifi, bedding, towels and everything you need for a comfortable stay. As well as kitchen essentials, we provide a selection of local produce. This is likely to include eggs from our hens, organic milk from the nearby Bruton dairy, local butter, bread from the bakery on the High Street, and a bottle each of our cider and apple juice. We have just completed a full redecoration, including new bathroom. We're really proud of it. New photos will be up soon. Come and see for yourselves! CEO, Xelsion, focusing on programmatic and biddable media, analytics and consultancy; father of two lovely girls with a long-suffering wife; farmer of 4 hens, and cider-maker. The Hayloft is on the same area of land as our main residence. As a former out-building it came as package. We moved to Castle Cary from London a few years ago and love its calm, friendly, independent atmosphere. The bathroom has a power shower, basin, bath and toilet. We're right on the quiet high street but the garden backs on to fields. The best of town and country at once. We put in a selection of local produce for your arrival along with basic staples like tea and coffee. Well equipped kitchen including cooker, fridge freezer, microwave, coffee filter machine, washing machine and tumble drier plus all utensils necessary to cook for yourselves. Please feel free to use the top garden. As well as kitchen essentials, we put in a selection of local produce. This is likely to include eggs from our hens, organic milk from the nearby Bruton dairy, local butter, bread from the bakery on the High Street, a bottle of cider and bottle of apple juice which is ours subject to not having drunk it all ourselves! We really enjoyed the quiet, privacy and beautiful garden to look out on as well as the proximity to the town's lovely shops, galleries and cafes. The house was very clean, well equipped and as expected. The access arrangements were simple and the information provided by the owner was clear and thorough. The welcome pack of local produce was a really nice touch. All in all a fab stay. Thank you. We needed a weekend base whilst attending a family wedding and the Hayloft perfectly fitted the bill. Supremely comfortable beds and complete silence (a wonderful novelty when you live in a city!) meant we all slept very well. The owner generously provided locally made bread and butter, eggs from his beautiful, very friendly chickens and homemade apple juice, all of which were delicious. We had everything we needed in the way of equipment and facilities and were very happy to have found the Hayloft. Many thanks for contributing to our wonderful weekend. Great to hear you had a good time Liz. Thanks for the lovely review and hope to host you again. Very nice stay in a well presented accommodation. 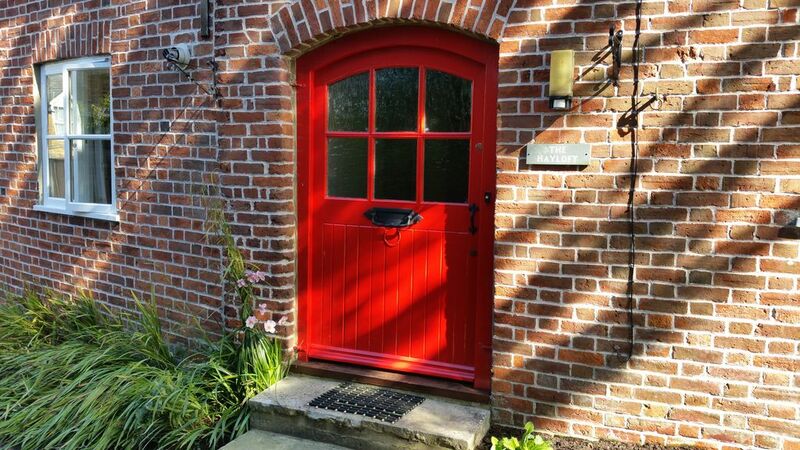 A lovely renovation on the Hayloft and has everything that you need for a stay. Great location in the village too. Thanks Carole. Happy New Year! Spacious comfortable accomodation convenient to many historical sites and charming villages. We spent 4 nights at The Hayloft. The beds and pillows were particularly comfortable and the knives were good and sharp for preparing local produce. This was given a head start by the local milk, eggs, bread and butter that were supplied with the booking. The owner, John, is very pleasant and helpful and is in the next property if there are any problems. Wifi was good and consistent. Castle Cary is an attractive village with a historic market building and a small but good Tuesday produce market. We enjoyed our time here and used it as a base from which to drive to various historical sites and houses. Thanks for the lovely, considered review Margaret. Good having you stay. Beautiful spacious cottage tucked away behind large gates and a small lane. The garden is a lovely size and ideal for playing ball throw with the dog which we did at least twice a day with our dog who was safe from traffic and delighted with his freedom. Lots of extras provided including eggs, milk, bread, cider, apple juice, condiments, soap, loo rolls, etc. John was welcoming and available if there were any problems which there wasn't. Constructive suggestions which won't cost much - a small step stool in the kitchen so us short people can reach the upper shelves, a couple of waste paper bins, one in the lounge, one upstairs and a non slip mat for the bath. But all in all the perfect getaway and just what we needed. Thanks for staying Glynis and for the considered review. Steps, waste paper bins and non-slip bath mat on the list! Castle Cary is a beautiful, small and friendly market town with a thriving heart of shops, pubs and restaurants.